Strawberry & Fern Canyon Hiking Trails! 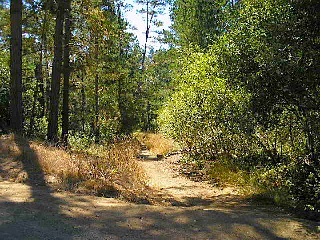 Cambria Hiking Trails are a main attraction for visitors to Cambria, California. The mouth to Fern Canyon is located at my front door. Actually, the road in front of my house is part of the trail. 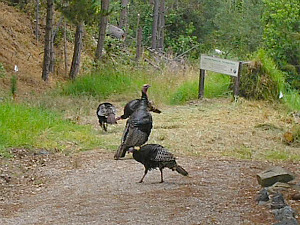 Fern Canyon is spectacular and filled with delightful sounds of nature, like wild turkeys. through the cany on. I don't really like the skunks but they are part of the canyon. In fact, I can step out the front door and watch the animals almost anytime of the day. Recently we have been invaded by wild turkeys. It is really cool to walk out the door and hear a flock of wild turkeys gobbling in the background. The day I took this picture there were about nine turkeys grazing along the mouth of Fern Canyon. Before going on I have to tell this story. One night my wife and I heard a loud screeching, screaming sound coming from the trail. The scream brought me up out of my chair like a bullet. It sounded like a woman screaming but I knew it wasn't a person. I bolted out the front door, flash light in hand wearing my flimsy house shoes. I walked towards the mouth of the canyon, shined the light and then the hair on the back of my necks went to attention. A gaint mountain lion was heading straight for me. When the light hit the lions eyes they turned orange. I couldn't run because I had my house shoes on. Finally, thank God, it jumped off the path and headed up the hill you see in the picture below. Don't worry the trail is safe. Mountain Lions, on occasion, do visit our town but not very often. 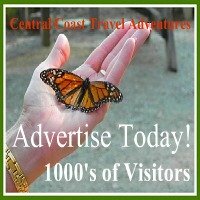 Fern Canyon is a great place for Cambria hiking but make sure you hike this trail in the day time. You never know where a lion might be hiding. Seriously, be careful on all the trails in Cambria. You need to be prepared for anything. As I mentioned, Fern Canyon is located on my street. Let me tell you how to get here. Coming down hwy 1 going north take a right on Burton Drive. Go to the stop sign, take a right then take the first right, which is Camborne Place. If you let me know your coming I will have a hot cup of coffee waiting and make sure all the lions are gone. For a map of Cambria Cambria Hiking Maps Click Here. 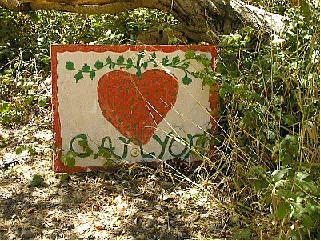 This Strawberry Canyon hiking trail is hard to find. 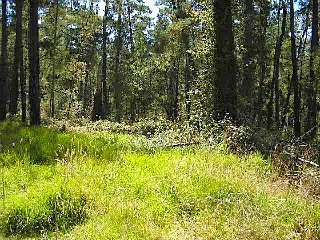 The sign you see, in the picture, is not visible from the road. Many people don't know about this unique trail which leads to the sea. On this trail you can find all sorts of interesting features. It even has benches along the way to sit down and rest a spell. This trail is easy to walk. It is open and you can see through the forest. There a few hills towards the end but for the most part is an easy hike with a lot to see. In order to find this trail you have to head down Burton until you come to Kay drive. When you see Kay drive you are at the mouth of the trail. If you are not familiar with the area you will have to look really close. I suggest you download the map from the chamber and use it to find this trail. 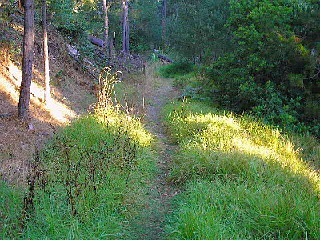 The Cambria Hiking Trails can be the most fun you have while visiting Cambria, California. After hiking it is fun to stop and shop in some of the many stores in town. I suggest you take a jacket with you and if you don't have one go to the Cambria Wildwood Store Cambria Hiking Trails Clothes - Cambria Wildwood. The hiking trails are great places to take pictures. Don't forget to bring your camera. If you love the woods Fern Canyon and Strawberry Canyon trails are great places to hike.